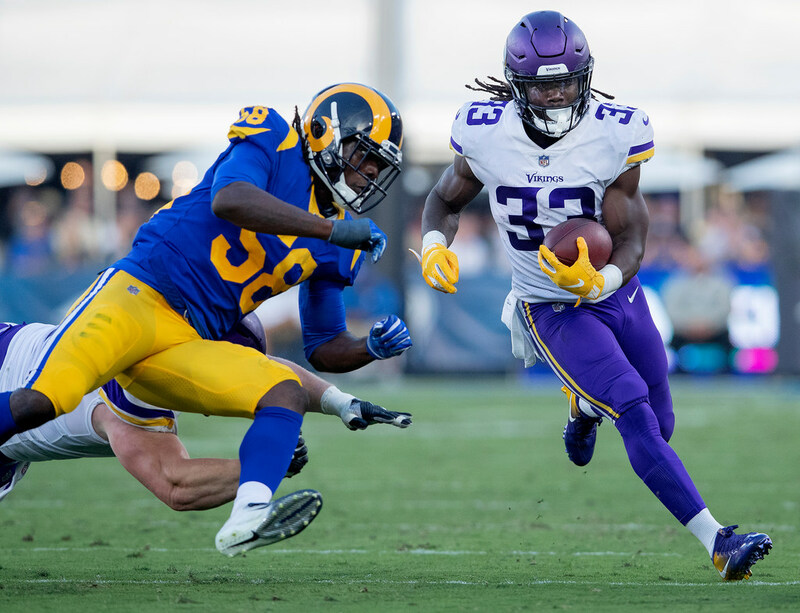 Running back Dalvin Cook is listed questionable to play Sunday against the Eagles due to a hamstring injury that kept him from practicing with the team this week. Cook, who has 205 yards from scrimmage this season, was on a snap count a week and a half ago against the Rams. He has been unable to practice since taking 10 carries for 20 yards in Los Angeles. The Vikings ruled out four players on Friday: defensive ends Everson Griffen and Tashawn Bower (ankle) and cornerbacks Trae Waynes (concussion) and Marcus Sherels (ribs). Griffen will miss his third game while away from the team to address mental health concerns. Sherels is also set to miss his third game after injuring his ribs in the Sept. 16 tie in Green Bay. The Vikings defense is down to two healthy defensive ends in Danielle Hunter and Stephen Weatherly, who walked around the locker room Friday with a large bag of ice taped to his left knee. Anthony Barr, the former 3-4 outside linebacker at UCLA, is a possible option to line up as an edge defender. The good news is reserves defensive tackle Tom Johnson and safety Anthony Harris are set to return after injuries held them out of the loss to the Rams. Eagles’ injury report: DE Derek Barnett (shoulder) and RB Darren Sproles (hamstring) are out; DT Haloti Ngata (calf) and RB Corey Clement (quad) are questionable to play. Harrison Smith and Terence Newman share their film study tips: "You have to learn how much to take with you"